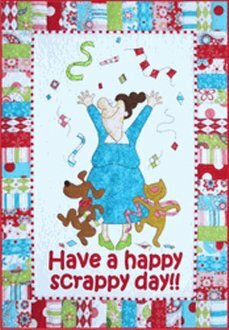 Includes full size patterns, placement sheets, and instructions to make the 23" x 33 1/2" Have a Happy Scrappy Day wall hanging and the 43 1/2" x 49" Scrappy Baskets quilt. The wall hanging is fusible applique and the baskets are pieced. Both quilts are great for charm packs.